A: lid, B: base. Shoe box is coated cardboard, with "Salvatore Ferragamo" printed in tan on a red background. 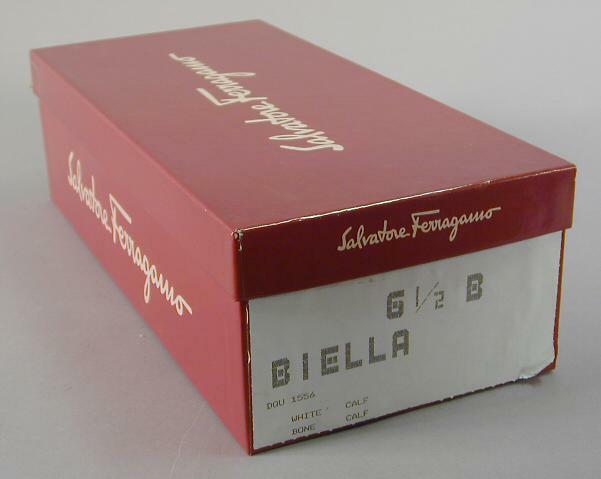 Shoebox housed a pair of Ferragamo shoes, 2002.62.7a-b, which were purchased at I. Magnin & Co., per price tag which has been glued to interior of box. Price tag lists the style name, various numeric store codes, and the original purchase price, $186.00. Box also has a white paper label covering one end of the base, which gives the size (6 1/2 B), the style name (Biella), and the colors (white calf and bone calf).